plays Ron in the films, is absolutely petrified of spiders. 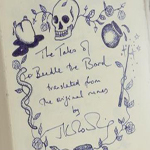 Jo also noted the prompting behind the decision to publish the Beedle tales was brought about by fans. only someone who had two million pounds could afford to read the book.